A selection of the latest Local, Regional, National & World News. A man has been charged with allegedly assaulting a News Corp Australia photographer and intimidating a female journalist after a Fraser Anning media event. There were a few people expecting a low turn turnout for Merrigum’s Easter Saturday competition, however those in the know realised that the combination of a par event and very pleasant weather would attract a strong field. MURRAY River Council is in a solid position to host regional, state or national events, as detailed in a capacity and capability assessment report delivered to council at its recent ordinary meeting. Chinese President Xi Jinping has attempted in a keynote forum address to play down fears the Belt and Road Initiative fuels corruption and sets debt traps. Wheat planting season comes even as crop-friendly growing conditions in the northern hemisphere are expected to boost world supplies. The Clark family has always had firm plans for a future in the dairy industry. A total of $11200 will be provided to a number of events in the local community to ensure their continued success and prosperity. Are you keen to have your say on climate change and the environment? Two people have been arrested during a “routine operation” for the Melbourne Joint Counter Terrorism Team in Melbourne on Friday. News photographer Megan Fisher visited Victoria Park Lake yesterday and caught up with some of the children enjoying the playground facilities. Sri Lankans have been urged to avoid mosques and churches after the Easter bombings, with the government hunting 140 people believed to have IS links. The Stroke, Monthly Medal event sponsored by Drummond Golf and Newton’s Parcel Service was played in warm conditions which suited many players as some excellent scores were recorded. Four players came in with 67 nett with A and B-grade winners decided on countbacks. Judy Baker was the lucky winner, surviving the countback to win A-grade and the Monthly Medal. Runner-up on countback was Robyn Downs, but Robyn was rewarded with the Scratch trophy for her 86 strokes. On March 28, local elder and Tatura resident Gwen Atkinson was invited to attend the Australian War Memorial in Canberra for a monument unveiling and a book launch. Goulburn Valley League netball round three action delivered some intriguing performances right across the board, with the draw between Rochester and Kyabram the standout. An educational video about World War I Victoria Cross recipient Robert Mactier will be launched on Wednesday. The Easter Tournament at Hill Top was blessed with perfect weather, a course well prepared with plenty of run, and a generous sponsor in Brady Bourke from Tatura Family Butcher. The Mulligans Day on Good Friday raised a tenth of Tatura’s total for the Royal Children’s Hospital and was enjoyed by all while raising money for an excellent cause. Saturday’s stableford competition attracted 94 entries and the mixed fourball on Sunday produced some amazing scores. With Monday’s fourball still to come, the tournament has been an outstanding success with caravanners already booking for next year. KEEN fishermen will flock to Nagambie over the Anzac Day long weekend for the inaugural GoFish competition. The 117th traditional Molyullah Easter Sports day was a success with activities and fun for all, drawing crowds from across the state’s north east. Berrigan Shire Council has knocked back a request for funding from the Southern Riverina Gliding Club. The north-east train line recorded its worst performance in five years last month, with just 52.7 per cent of services arriving on time. 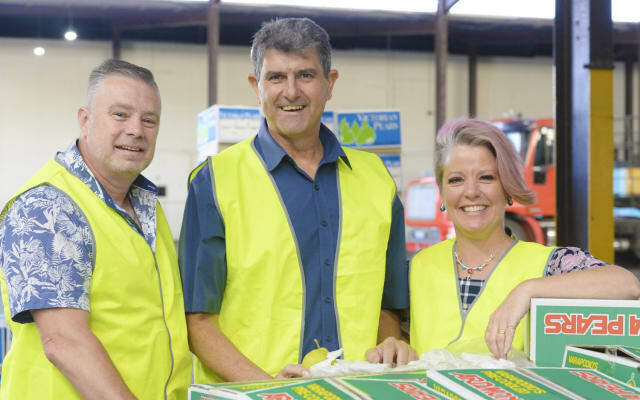 Deniliquin and district will make a record donation to the annual Good Friday Appeal this year. Euroa faces an extremely tough task as round four of the Goulburn Valley League netball competition continues tomorrow. A delegation of Iraqi senior officials have visited Shepparton in a bid to learn how to rebuild their ancient irrigation system. Eye cancer, a tumour on the eyelid or eyeball, is the most common form of cancer in cattle, and in the early stages can be mis-identified as pink-eye. My Kitchen Rules contestants Mick and Jodie-Anne Barlow teamed up with Ardmona orchardist Rocky Varapodio last week to support the Royal Children’s Hospital Good Friday Appeal. A nationwide consultation process will start next month to help develop a plan for the future of Australian dairy. State Member for Euroa Steph Ryan has accused the Andrews Government of excluding Mitchell Shire farmers from a program which provides grants of up to $5000 to assist them with on-farm infrastructure to help manage drought. Adam Trinder and Anthony Darmanin have enjoyed success in Melbourne this season with Mystic Journey and will try to add a Caulfield win with Twitchy Frank. Port Adelaide have defeated North Melbourne by 16 points in their AFL game at Adelaide Oval. Taylor Swift has released a cheerful pop duet alongside Brendon Urie called “ME!” along with a colourful music video. Could the Liberals lose a significant number seats because of any preference deal with Clive Palmer?